October marks National Bullying Prevention Month. Started in 2006 by PACER’s National Bullying Prevention Center, this campaign has burgeoned from an annual week of awareness to an annual month-long initiative to unite communities nationwide to support bullying prevention through activities, education, and outreach. Bullying is a national problem that affects hundreds of thousands of people daily. According to PACER’s National Bullying Prevention Center, more than 160,000 students stay home from school each day for fear of being bullied. Furthermore, bullying leads to depression, anxiety, and other mental and physical health problems in children and adults. Famous singer and actress, Demi Lovato has previously stated that her experiences with being bullied during childhood contributed to her struggle with bulimia and depression. During the 2010 National Bullying Prevention Month, she partnered with PACER’s National Bullying Prevention Center and Facebook to encourage teens to join the cause and stop cyberbullying. This year, there are many ways to get involved throughout the month of October. Partnering with Green Giant, PACER’s National Bullying Prevention Center is asking adults to Raise a Giant by writing to the children in their lives to help them to stand up to bullying. The center is also asking people to raise awareness on social media, participate in Unity Day on Wednesday, October 9th by wearing ORANGE to support bullying prevention, and get involved in a local Run, Walk, Roll Against Bullying event. “The End of Bullying Begins with Me”, the theme of National Bullying Prevention Month, is a clear one. 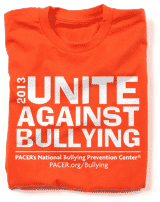 It asks each of us to be empowered, raise awareness, and take action against bullying. Here at CEED, we are happy to be an advocate for bullying prevention. We encourage you to get involved during the remainder of National Bullying Prevention Month, and throughout the year to be a partner against bullying and to inspire those around you to do the same.